Play miniature golf! 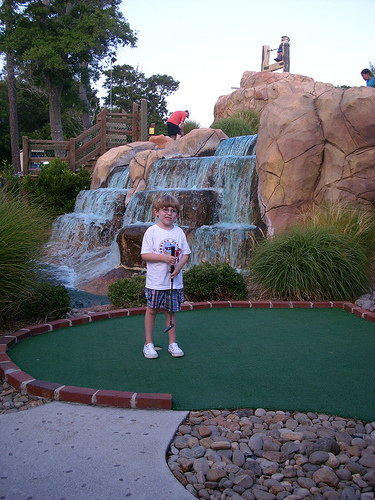 There are several Crystal Coast miniature golf courses located in and around Emerald Isle. My personal favorite is the Emerald Forest Putt-Putt “tract”. It’s located adjacent to the Pacific Beach Superstore at 8720 Reed Drive across from the Emerald Plantation Shopping Center. The course is still in fairly good condition. That means the bricks that outline each hole allow for the ball to remain on that particular hole. This is very important for those “junior golfers” who might find it a bit of a challenge to keep their ball on the course. Crystal Coast Blog secret: Local catalogs contain a $1 off coupon so be sure you have yours when you arrive. Call ahead for hours of operation: 252-354-5034. Visit the NC Aquarium at Pine Knoll Shores! Rainy days at the Crystal Coast are common in the late summer and early fall months so why not take advantage of those rainy days by planning a trip to the North Carolina Aquarium at Pine Knoll Shores. Crystal Coast Blog secret: This is a very popular Crystal Coast attraction, so be prepared to get there early especially on those dreary days at the beach. Go Fly a Kite! Scheduled for October 24th through the 26th, the Kite Fest is held at the Atlantic Beach Sheraton Hotel. It is a wonderful family friendly 2-day event with kite flying demos and activities held on the beach at the Sheraton. All events are organized by Kites Unlimited of Atlantic Beach. For more information, please call 252-247-7011. Crystal Coast Blog secret: This is another popular event and parking space can be difficult to find. Come early and avoid a long hike to the festival site. Go Fish! The fall is the perfect time to take a kid fishing. Whether it’s casting your line from the shores of the Crystal Coast or from the Bogue Inlet fishing pier, the fall time of year is best time to land the big one. 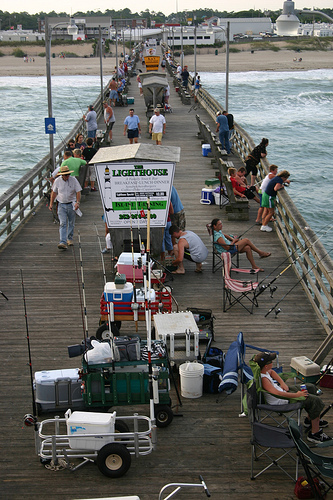 Crystal Coast Blog secret: Make your trip more convenient by simply renting your fishing gear from the Bogue Inlet fishing pier in Emerald Isle. For those families headed down to the beach from the Triangle area, many stop at the Neuse Sport Shop in Kinston, NC for bait, rods and reels. What Are the Other Kid-Friendly Things to do on the Crystal Coast? Be sure to leave a comment let our readers know what other fun things you have discovered on the Crystal Coast during the fall season.